Two Lives… separated by millennia but nevertheless linked irrevocably. What possible link could Mark Hayek, an introverted twenty-first century research scientist, have to Raven, a young healer who lived during the late Pleistocene? It has everything to do with an injured Neanderthal man taken captive by Raven’s band while he and his brothers were hunting bison. I read the first of the Replacement Chronicles, Raven’s Choice, in early 2015 and loved it. As that is included in this omnibus, I’ll add my thoughts from the previous review. A father from Chicago takes a road trip to the city of Whitehorse, in Yukon Territory, with his wife and son. During the car ride, they reveal to the boy their harrowing experience surviving a horrific plane crash in the wilderness ten years before, which is how the boy, in fact, came to be born. Fair’s fair. 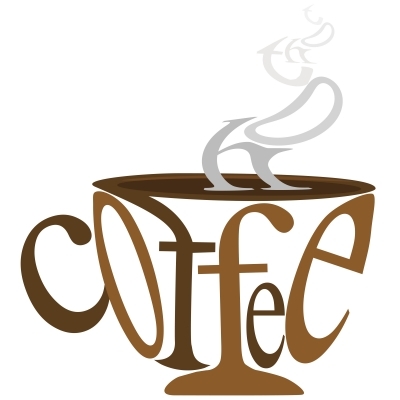 Or is it…? Megan and Tory have never seen eye to eye. They may be born of the same mother, but that’s where the common ground ends. I’m very pleased to welcome Tina on the last day of her blog tour, as she talks about her ongoing passion for horses. 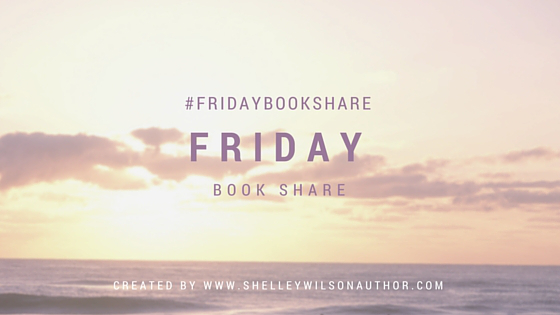 #FridayBookShare ~ an excellent idea created by Shelley Wilson. The weekend is a good time to look for new books and this meme might just point us towards some great new reading ideas. In 1996, Josephine Grey and Freya Seymour are best friends and on the brink of great success. Both are students at the elite private school Greenwood Hall and Josephine, the daughter of the advisor to the Prime Minister, is heading for everything she has ever worked for: Head Girl, Oxford, the demons of her mother finally abated once and for all. Baby Girl is a mother’s story. It’s about the greatest sacrifice a mother can make when she wants only the best for her child. It’s about falling in and out of love, of losing and finding one’s self. It’s about the perilous journey from passionate young love to happy true love and understanding the differences between the two. The Calling of the Raven is the sequel to the acclaimed novel, Leap the Wild Water, and continues Megan’s quest for acceptance, autonomy, and unconditional love. Megan is resolved to tell Eli of the affair she had before they married and of her illegitimate daughter, Fortune, which her brother, Morgan, and Mam stole from her to save the family from shame. Before Megan has a chance to tell Eli, her plans are scuppered by a chance meeting with her old lover; the ne’er-do-well, Iago. Megan’s life again takes a turn for the worse and there seems to be no mending the damage Iago has caused. After she nearly ruins her family with a terrible misstep, Elena Spira is sent to Venice to escape disgrace and to atone by caring for the ailing Samuel Farber. But the crumbling and decaying Ca’ Basilio palazzo, where Samuel is ensconced, holds tragic secrets, and little does Elena know how profoundly they will impact her. Soon she begins to sense that she is being watched by something. And when Samuel begins to have hallucinations that make him violent and unpredictable, she can’t deny she’s in mortal danger. Born in the Highlands, Kuini thought his life was simple. You hunt and you fight, defending your towns against the raids of the Lowlanders and then raiding their lands in turn. His father was the Warriors’ Leader, and he wanted to be just like him. Annie only needs to find one… the one that will save Oliver’s life. On the day of their wedding, Annie saw nothing but happiness ahead, but when an accident calls her back to Memory House, her world is changed forever. Ophelia Browne, the woman who taught Annie to find the memories in a forgotten object, is leaving the house and she’s leaving all those powerful memories behind. Annie Cross’s life changed completely a year ago. The change began the day she found Memory House Bed and Breakfast and met Ophelia Browne. Annie thought Ophelia was just a sweet old lady who had a way with herbs and wonderfully scented and seemingly magical potpourri. But Ophelia taught Annie things she never would have believed. And now she was marrying Oliver, in the same church where Ophelia married her late husband, Edward, as a direct result of finding memories in forgotten objects. The minute Annie touched the old bicycle, and began working on sprucing it up, the memories started with an echo of a boy’s laughter. That’s what lead her to Ethan Allen Doyle and from there to his son, Oliver. You can tell me seven ways from Sunday there’s no such thing as magic, and you might be right. But since I’ve allowed my heart to believe in the things Ophelia taught me, my life is filled with the magic of love and happiness. Well, you pack your bags, grab half of the equity in the house you’ve both lovingly restored and run away to an idyllic little cottage in the country. I suppose not having the cottage surveyed was the first mistake—buying with your heart, and not your head, isn’t the wisest move. The second was moving in six days before Christmas, the day the heavens decided to open and the rain just kept on coming. Having spent a pleasant day preparing to harness his muse and strolling around his local neighbourhood committing acts of literary vandalism, our hero contemplates his research into such matters as he prepares for his date with the gorgeous Tylissa. The date does not work out as he had hoped. In fact, the whole night turns into a disaster of spectacular proportions, but the worst surprise of all waits for him on his return home…. Part two of the story of Inkker Hauser, Literastein, follows straight on from Rum Hijack and takes place over the course of a day. After stocking up on groceries and booze, Inkker decides he needs new clothes for his date that evening and proceeds to buy several shirts and a couple of trouser suits which would also, he thought, further his intellectual self-image. After delivering a tirade of abuse at his Twitter timeline and logging in to his account to change his name to Inkker Hauser, he has an idea and takes a trip into town. I popped the lid off the pen and turned to the title page just inside the book. An inch or so below the title, in large letters, as neatly as I could under the circumstances, I wrote: #InkkerHauser. I put the lid on the pen quickly, closed the book, got up and returned it to the shelf. A wave of exhilaration shot through me. Being privy to Inkker’s inner monologue and observations is fairly intense, his thoughts are quite extreme but that only makes him a more captivating protagonist, maybe in part because he’s a loner, mostly scorned by others, has a fragile grip on reality and he’s hurting. The weirdness and eccentricities are increasing. And he must be slowly killing himself with amount of alcohol he consumes. Well lubricated before his date after several afternoon drinks in the pub, and more at home watching the video documentary of the Kursk submarine disaster, the evening was destined to be a major disaster. Inkker still firmly believes he will write the literary masterpiece he believes himself capable of, if he could just write that first elusive sentence. The more he drinks, the more he tries to impress Tylissa, the more outrageous and unpredictable his behaviour and dialogue become. His despair as the evening goes downhill with increasing speed is tangible. And when he gets home, to top it all off, he learns he has a new neighbour. This information, coupled with the events of the last few hours, sends him into a tailspin and causes quite a meltdown. Phil comes from southern England and now lives in the US. He is a radical, innovative, avant-garde writer whose prose attracts readers every time it is encountered. 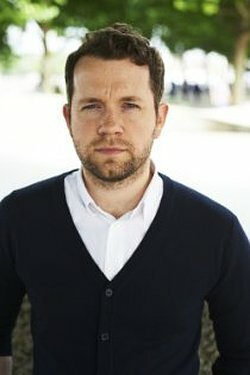 His influences are many but he has been compared favourably with Rimbaud, Bukowski and Dosteovesky for his dark and earthy tales of outsiders on the edge. Inkker Hauser Part 1: Rum Hijack, his debut on Amazon, is the darkly comic tale of a frustrated and slightly insane would-be writer who begins taking out his “writers’ block” on the local community. Inkker Hauser Part 2 is the follow-up and contains a hysterical, surreal and agonising karaoke sequence, which will probably never be equalled. Rum Hijack was recently included in a list of the top 50 Best Indie books of the year in 2014. Phil’s other main interests are music and basketball – and is a fan of the Chicago Bulls. 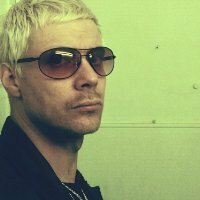 His Bukowskiesque blog, Motel Literastein, about an Englishman living on the fringes of society and sanity in a motel in Philadelphia, is controversial, confrontational and cathartic, but never dull, beautifully written and well worth following. He will probably never return home. A Child. A Horse. A Miracle. Eight year old Dannie Walker is fighting for her life. Her doctors have told her father she has an incurable disease. All hope is lost. Or is it? 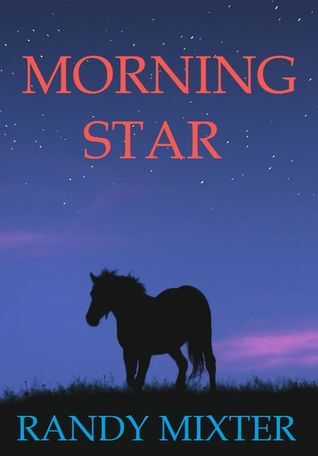 Mysterious and majestic, Morning Star appears in spectacular fashion, sailing over the barbed wire fence as Nate Walker is checking the perimeter of his horse ranch for any damage, and gallops on towards his house. Dannie Walker is in hospital, a very sick girl, without apparent hope of recovery. Dannie has a vivid dream one night about a horse and desperately wants to go home. She isn’t the only one having dreams, her father has his own ghosts he needs to lay to rest. The horse raised its head and their eyes met and in those dark eyes she could see everything; all the good, all the hopes, all the dreams. And she felt a voice more than heard it. A voice she had never heard before but still seemed familiar. A voice that began in her head before it spread throughout her body. A voice that brought her peace and joy. Mix these elements together with a loving family, a magical horse and a legend about a blue flower and you have a heart warming and captivating story of miracles and mysticism, love, loss and hope. Things Randy Mixter writes about extremely well. I love the introduction about the legend of the Morning Star, a dark blue rose-like flower, explaining how it’s been extinct for many hundreds of years and opinion is divided about the truth of the plant’s existence. Morning Star was thought to be discovered and worshipped by the Maya empire on or about 900 AD, if their hieroglyphics were any indication. The Maya culture believed the flower had mystical powers while in full bloom. I believe this novella would appeal to younger readers, just the right length, as well as older ones that want to escape for a couple of hours into a wonderfully descriptive world of mystery and enchantment, which makes anything seem possible, and with a touch of the paranormal. A great story. 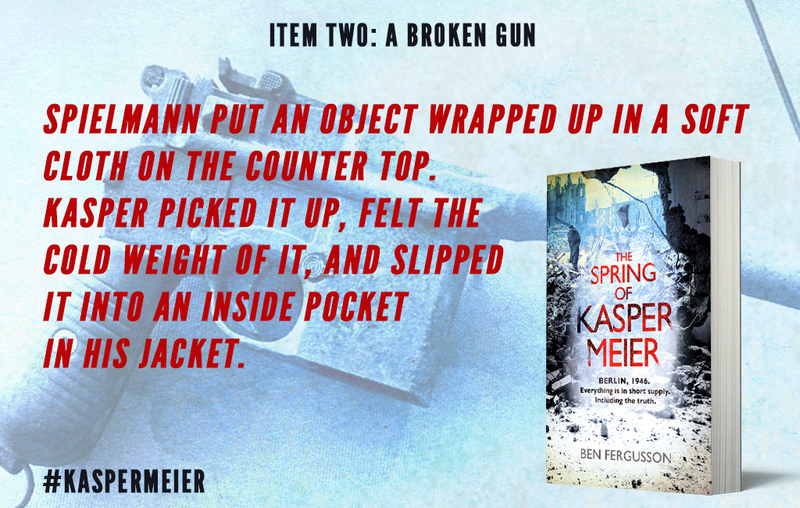 The Spring of Kasper Meier is a gripping thriller set in a surreal and terrifying post-war Berlin, where nothing is quite what it seems. To celebrate publication of Ben Fergusson’s unforgettable debut, Little, Brown are running a ‘treasure hunt’ on twitter – with a prize of a weekend in Berlin up for grabs, as well as copies of the book. Just find the picture of the item, save it, then tweet it with the #KasperMeier. We’ll pick five winners every day to get a free copy, and then one winner will be chosen at the end of the week for the weekend in Berlin! Olivia Westerly is the only person Ethan Allen can trust, and he’s not too sure he can trust her. She’s got no love of children and a truckload of superstitions–one of them is the belief that eleven is the unluckiest number on earth. 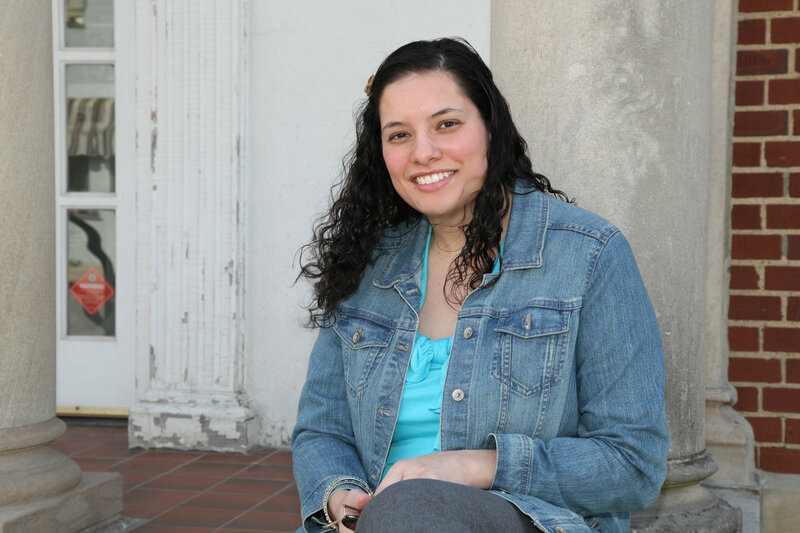 Olivia avoided marriage for almost forty years. But when Charlie Doyle happened along, he was simply too wonderful to resist. Now she’s a widow with an eleven-year-old boy claiming to be her grandson. 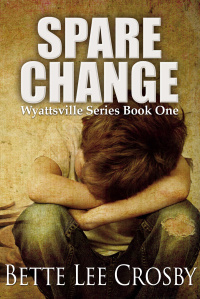 Set in the 1950s Spare Change is a story from differing viewpoints. Olivia Westerly is quite happy being independent and living on her own, working at the telephone exchange. With no desire to get married, much less have children, her life continues comfortably in the same way it has for years. Until, that is, she meets Charlie Doyle. It doesn’t take long for Charlie to woo her and almost before she knows what’s happened they are married and Olivia is happier than she ever thought possible. But Charlie dies on their honeymoon and Olivia is inconsolable. Ethan Allen is eleven years old living with his parents on a farm. His mama, Susannah, is flighty and totally undomesticated, she just wants to go to New York City to be a singer, it’s all she talks about. But Ethan’s daddy, Benjamin, has no intention of allowing it. Between the fighting, making up and general disregard from his parents Ethan does’t have much of a childhood or upbringing. When horrific and violent events occur he runs to the only person he can think of, the grandfather he has never met. This is a gritty and, at times, tragic story with very distinctive, well-formed and colourful characters that will surely pull the reader into their lives. It was easy to get involved in the story and sympathise with the characters, especially Ethan. He is very credible given his life up to that point and the developing relationship between him and Olivia is touching. I like the way the characters are all woven together to create an engaging story with humour, sadness, some violence but also hope and trust. The first person perspectives at the beginning of each chapter is a nice touch, like eavesdropping on that character’s thoughts. There’s an unmistakable theme of good versus evil running through with a thread of Christianity, not in a preachy way, showing the best and worst of human nature. The epilogue may not appeal to all readers but for me it rounds the story off nicely. 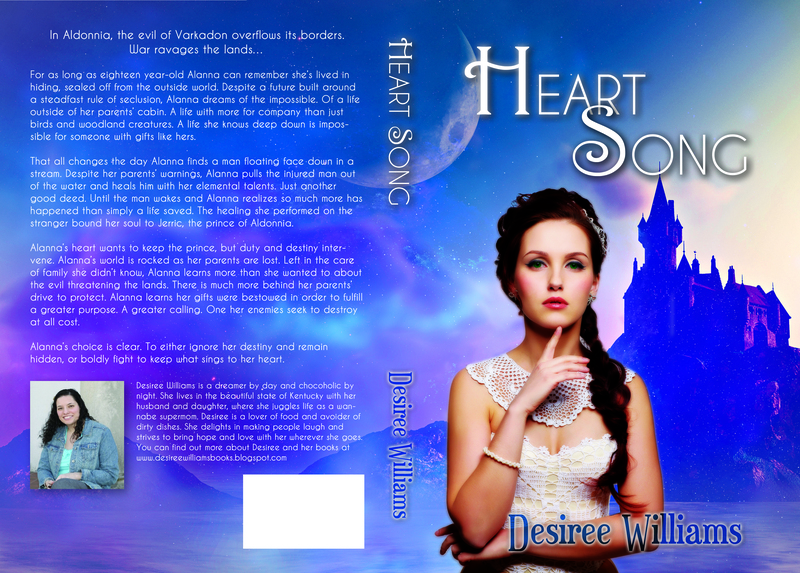 I’m very pleased to be able to share the lovely cover for Desiree Williams’ debut Young Adult Fantasy/Fiction novel, Heart Song, book one of the Heart Song series. For as long as eighteen year-old Alanna can remember she’s lived in hiding, sealed off from the outside world. 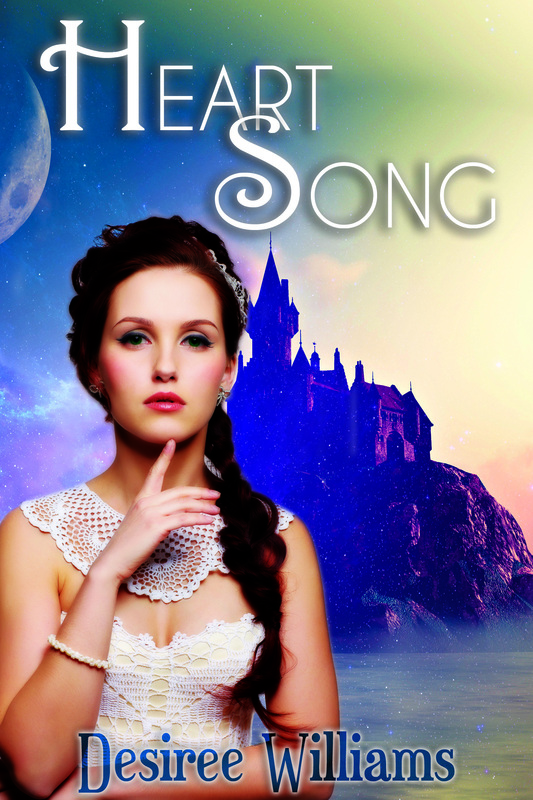 Despite a future built around a steadfast rule of seclusion, Alanna dreams of the impossible. Of a life outside of her parents’ cabin. A life with more for company than just birds and woodland creatures. 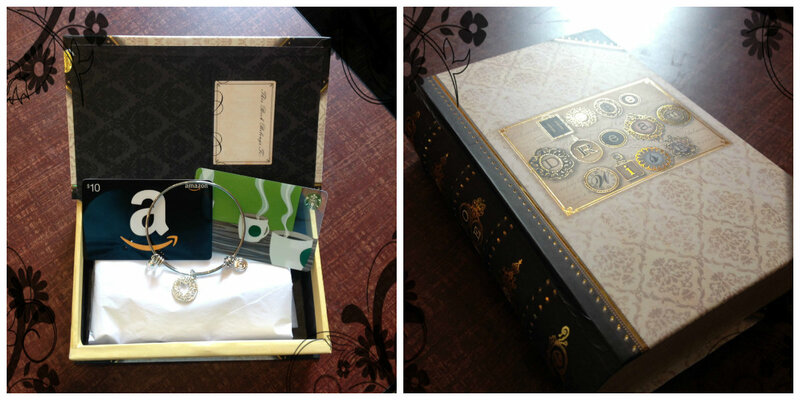 A life she knows deep down is impossible for someone with gifts like hers. That all changes the day Alanna finds a man floating face down in a stream. Despite her parents’ warnings, Alanna pulls the injured man out of the water and heals him with her elemental talents. Just another good deed. Until the man wakes and Alanna realizes so much more has happened than simply a life saved. The healing she performed on the stranger bound her soul to Jerric, the prince of Aldonnia. 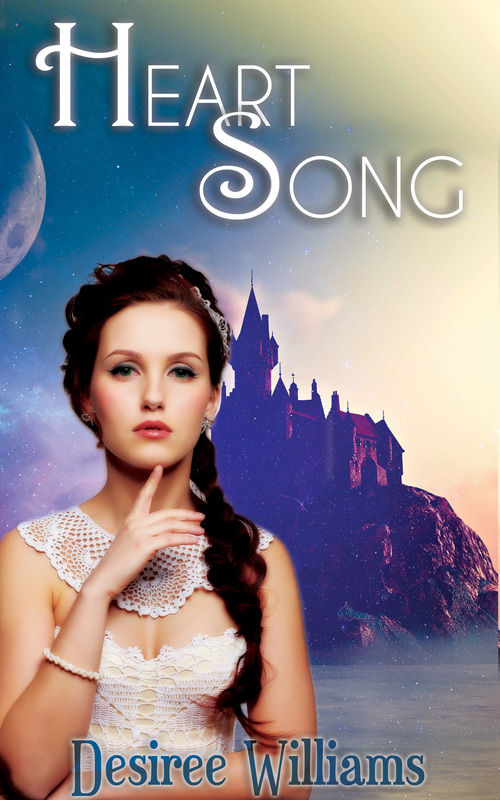 Alanna’s heart wants to keep the prince, but duty and destiny intervene. Alanna’s world is rocked as her parents are lost. Left in the care of family she didn’t know, Alanna learns more than she wanted to about the evil threatening the lands. There is much more behind her parents’ drive to protect. Alanna learns her gifts were bestowed in order to fulfill a greater purpose. A greater calling. One her enemies seek to destroy at all cost. Alanna’s choice is clear. To either ignore her destiny and remain hidden, or boldly fight to keep what sings to her heart. Desiree is offering a fabulous giveaway, to enter just click the Rafflecopter link. Awaiting the winner is a bracelet, $10 Amazon gift card and a $10 Starbucks gift card all wrapped up in a lovely little book box. Hayley Kincain has an interesting take on her peers, they’re either freaks or zombies. She’s spent the majority of her teenage years travelling around the country navigating for her truck driving dad. Now they’re living in her grandmother’s old house in their home town and Hayley has started high school which proves to be a challenge for her. She copes by being aloof, hiding her pain as best she can and not letting herself get close to anyone…until she meets Finn. Her father, Andy, has an altogether different way of coping with his problems. He’s dealing, or actually not dealing, with the aftermath of his military service in Iraq and Afghanistan with drink and drugs. It’s left to Hayley to look out for him and try to keep his unpredictable behaviour under control. They are both ravaged by Andy’s PTSD and it’s only getting worse. How much longer can Hayley manage. Written from Hayley’s point of view, she has a pithy and unique perspective due in no small part to her unconventional upbringing. Her mother died when she was very young and after several years in her grandmother’s care she became close to her dad’s partner who eventually left. Deep down Hayley is hurting and insecure. 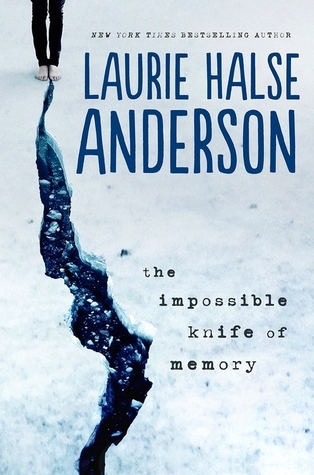 Her father’s flashbacks add poignancy and give an insight into the concept of PTSD. It’s so hard to grasp the enormity of the lasting effects this has. Both Hayley and her father have their demons to deal with and neither are coping well. The situations and characters are complex and realistic, very well-developed. It’s an exceptionally moving and compelling story of a family broken beyond bearing and although it makes difficult listening at times it’s incredibly well written. There’s no miraculously happy ending here but there is hope. The more I listen to Julia Whelan the more I like her narrations. She’s the perfect voice for Hayley and makes the strong, smart yet vulnerable character stand out. Luke Daniels’ narration of Andy’s flashback sections, although few and far between, convey the distressing emotion and absolute horror, the feelings and experiences of war and Andy’s appalling memories of the things he’s witnessed that now torment him.